i most people have been finding it difficult to get their project topics approve by their lecturers known as their project supervisor.i still remember back then in school when i struggle to look for a good project topic and after succeeding in getting one, their comes another delay in getting it approved by my supervisor.but in no time i was able to get him to approve the project topic not after i have made some little sacrifice and it was beneficial to me in the long run.so if you find your self in this little problem of getting your project topic approved by your project supervisor, then follow this tips and tricks i used to buy my supervisors heart to approve both my topic and also all my chapters from chapter one to charter five. step1: look for a good project topics from any where you may get it(you can go to various Nigerian universities or meet some one that has already graduated and also you can get from the internet. step2: arrange the most three best project topics you have succeeded in getting and take it to your supervisor,but before taking the project to him for approval, you must have sent him like #1000 recharge card and tell him how lucky you are to have him as your project supervisor. step3:when you meet with him, discuss and chat with him a little on a project related things and material to recommend for you to use in the project work. step4: after he must have approve your topic, please wait for like one day,then send him another recharge card, but this time should #500 recharge card.please don't call him after sending the recharge card as it may look like you are telling him that he can't afford it or bribing him. step5: continue to call and send recharge card and also motivational, prayers, and prosperity text message three times a week especially Fridays,Sunday's and Monday's. 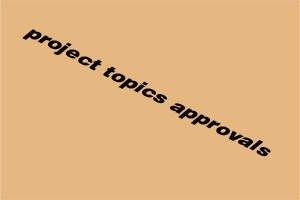 so i believe you can now see how easy it is to get that project topic of yours approved by your supervisor. No Responses to "how to make your lecturer approve your project topics fast"